Today’s recipe for hearty Cheesy Pizza Soup is like comfort in a bowl with a creamy tomato base, homestyle noodles, mini pepperoni and lots of cheese. It tastes like pizza and is delicious served with garlic bread and salad. Sponsored by Marzetti Reames Frozen Egg Noodles. I tend to get a little stuck, preparing the same meals for my family week after week. Brian and the kids give me suggestions sometimes, but we typically fall back on our tried-and-true favorites. We usually have soup at least once a week and pizza at least once a week. I decided to combine those two favorites and make pizza soup. 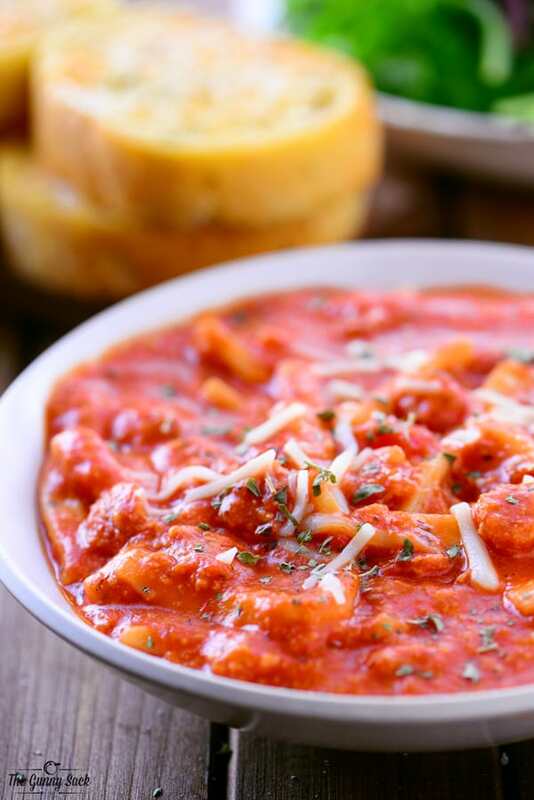 Try making it for a family dinner on a cold winter night! This recipe starts with Reames Homestyle Egg Noodles. This was my first experience with these noodles and now I can’t wait to try them in more hearty soups and casserole recipes. 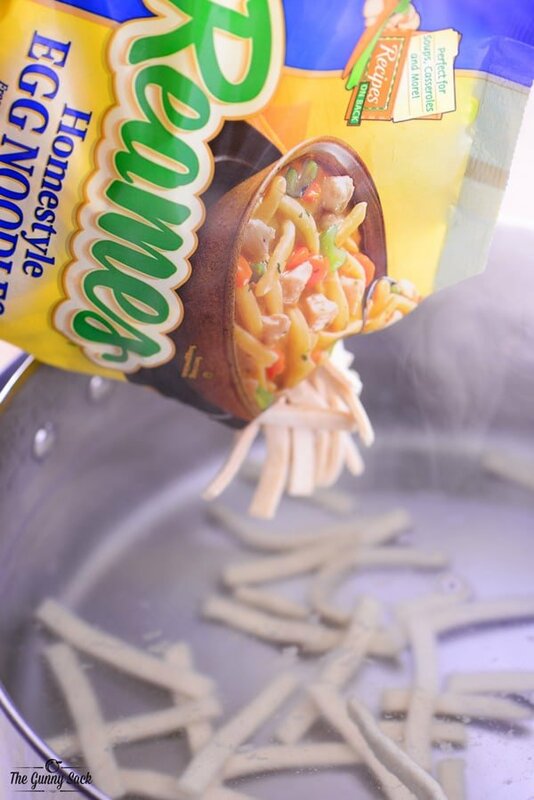 The Reames noodles I used in this recipe come frozen in a bag and they are boiled in water for a homemade taste. Start by bringing four quarts of water to a boil, add the frozen noodles, return to a boil and cook the noodles for twenty minutes. Drain well and return to pot. 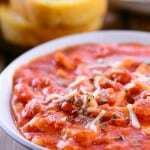 Add a jar of four cheese pasta sauce, a can of tomato soup, a jar of pizza sauce, milk, mini pepperoni, grated parmesan, and spices. Bring to a simmer over medium-low heat, stirring often. Remove from heat, add shredded cheese and stir until the cheese has melted. Garnish the soup with additional shredded cheese and a sprinkle of oregano. 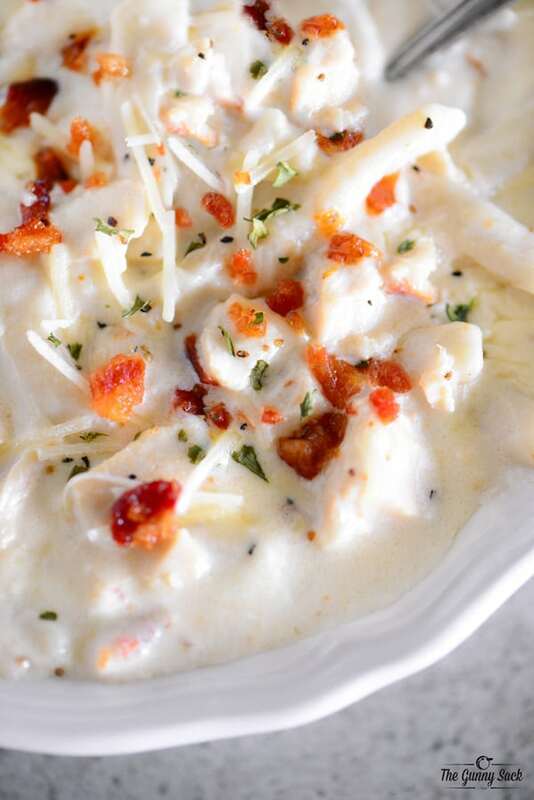 Serve with garlic cheese bread and a green salad. 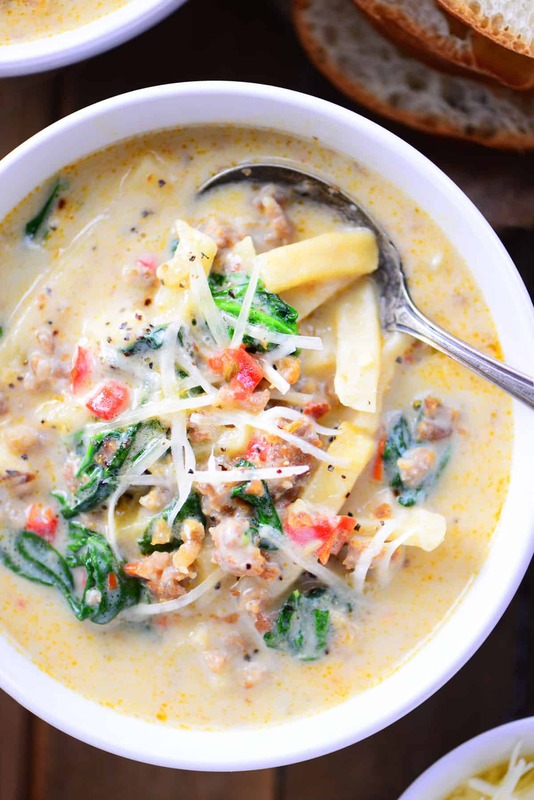 Make this hearty Cheesy Pizza Soup recipe for dinner on a cold winter night. It’s homemade taste with the creamy tomato base, homestyle noodles, mini pepperoni and lots of cheese, will help bring the family together! 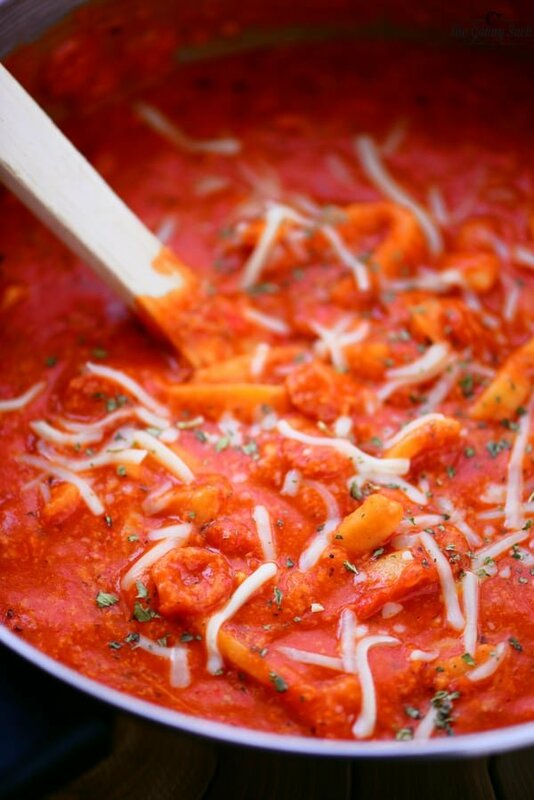 Hearty Cheesy Pizza Soup is like comfort in a bowl with a creamy tomato base, homestyle noodles, mini pepperoni and lots of cheese. It tastes like pizza and is delicious served with garlic bread and salad. Bring four quarts of water to a boil in a large pot, add the frozen noodles, return to a boil and cook the noodles for twenty minutes. Drain well and return to pot. Turn the heat to medium-low. Add pasta sauce, pizza sauce, condensed tomato soup, milk, mini pepperoni, parmesan, oregano, garlic, and pepper. Bring to a simmer, stirring often. Garnish with a sprinkle of oregano and additional shredded cheese. In the recipe, when you say 24 oz 3 cups of pasta sauce, is that one jar plus 3 cups of sauce? Sorry about that! The recipe card I use displays it in a confusing way. 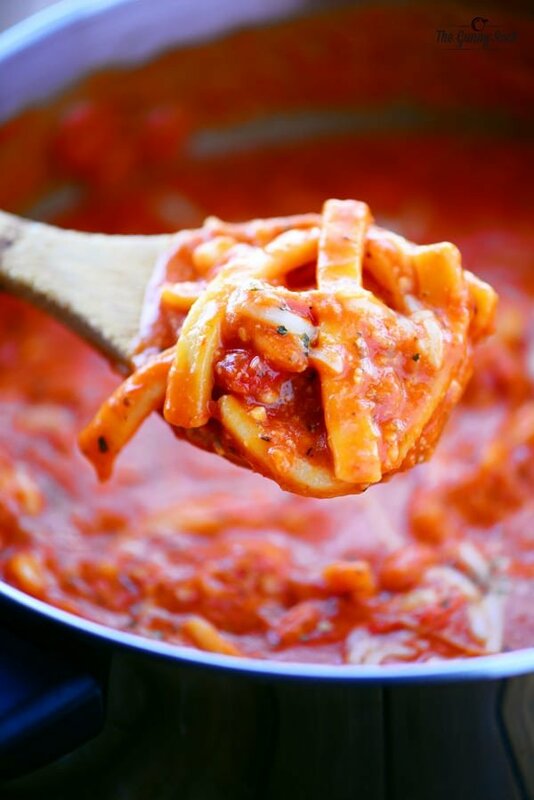 It is 24 oz of pasta sauce which is the same as 3 cups of pasta sauce in case you are using homemade sauce or sauce from a couple of smaller jar.